Petra by night. Whether you want to add this to a once-in-a-lifetime trip to Jordan, a weekend trip to Petra, or whether you just want to go down for this exclusively, it doesn't matter. It's worth the extra effort. The gist is, on Monday, Wednesday and Thursday of every week, they open Petra from 8:30 p.m.-10:30 p.m. for a special candlelight experience. Tickets cost 17JD (about $24) per person, and kids under 9 are free. 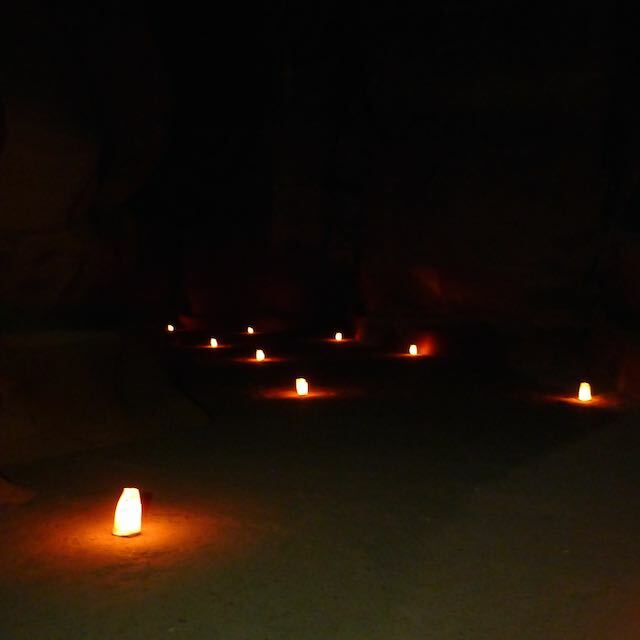 For the mile-long trek from the entrance, down through the siq to the Treasury, your path is lit by luminaries and moonlight. Then at the Treasury, there are hundreds of luminaries lighting the scene and there are blankets laid out for you to sit on and enjoy the 30-40 minutes of live music and storytelling. When the show is over, you turn around and head back up. 1. You can buy your entrance tickets through most hotels, or at the Petra gate. But confirm this with your hotel first. 2. Definitely try to get there at 8:30pm for the start of the walk. You don't have to travel as a group and you go at your own pace, but the live show does start once most people have reached the Treasury and you don't want to miss too much of it. 3. We were told this was offered year-round, however, like buying the tickets at the hotel, call first to confirm this before you jump in the car. 4. Some people bring flashlights, head lamps, or use their flashlight phone app, but depending on the moonlight, it's not completely necessary. But you do have to watch your footing on the uneven ground. 5. Because of the low light, taking pictures can be tricky. And if you're not used to taking photos with your SLR in the dark, practice first -- figuring it out in the siq can be frustrating and futile. 6. However, one tip for getting good pictures at the Treasury is to wait for the music to end, and the story-teller to begin his tale. Spotlights are then used to light up the Treasury and it can make for some fantastic photo opportunities. But be forewarned, after the story-teller finishes his tale and says good night, everyone will suddenly stand up to take their pictures and you'll get a whole mass of heads. So take your shots while he's talking, don't wait until the end. But tips or no tips, it's a great way to see a whole different side of Petra.